· Rarsuit SHOW & YELL! · FurCon: RARSUIT SHOW & YELL! · Mephit Fur Meet registration open til Aug 7th! Apparently this was a controversial ad in the UK. 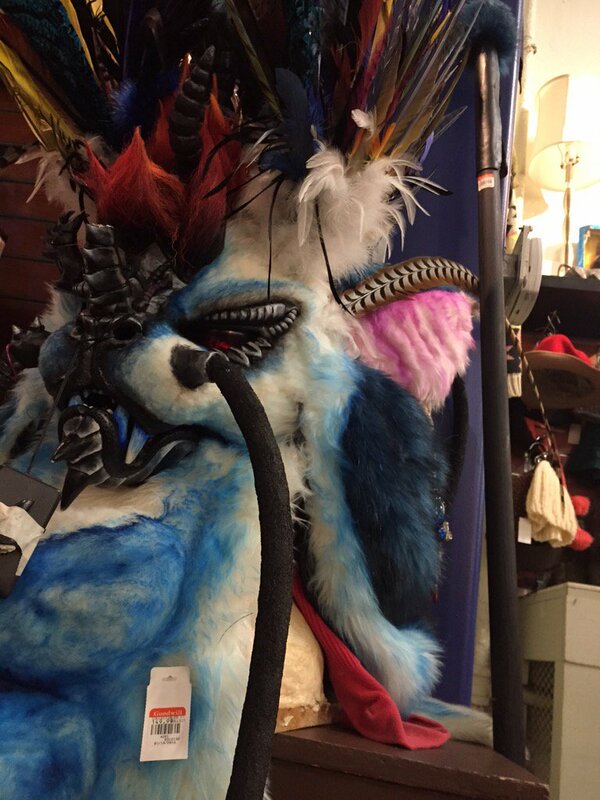 28th-Jan-2016 12:29 am - Mystery Rarsuit Head? The things people find in thrift stores! It sort of looks familiar, but I can't place it. Maybe it's a Power Rangers monster? An odd thing for someone to just give away in any event. 11th-Jan-2016 11:35 pm - Rarsuit SHOW & YELL! Last year, though it was called the "Rarsuit Roundtable," there wasn't much round-tabling...I'd brought along a projector & presentation "as a backup plan," ended up being most of the panel time. Toward the end, we'd opened it up to a "show & tell" format, and things really picked up. This year (now called "Rarsuit Show & Yell! "), gonna skip the projector and just go straight for the show & tell format. If you got a new rarsuit and wanna share it with folks, bring it! Or maybe you're working on your first rarsuit and have construction questions, or performance questions, or something else. Ask the group, and folks can chime in with their suggestions. Should the conversation stall, I have a set of 20 index cards to act as topic starters. (Based very loosely on the idea of Brian Eno's "Oblique Strategies" deck.) If nobody has a thing to talk about, we'll randomly pick a card, read it aloud, and hopefully this will jog someone into action or discussion. I'm NOT going to reveal the contents of the deck in advance, so this should be...interesting. ONE RULE: be excellent to each other. Oh also: OK to heads-off in panel. I'll tape up a sign near the door requesting no photos/video. Come and rar! The world needs more rarsuits! They're the best thing since...well no, they're just the best thing. Sun. 1:00 to 2:30pm: Rarsuit Show & Yell! The newest member of my rarsuit stable: Iso the werewolf (aka ISO Standard Calibration Werewolf, Imperial (SAE), Qty. 1 -- metric werewolves wear green or gray flannel and are slightly shorter). I was aiming specifically for a Halloween-focused suit for particular events and outings. There were several goals: the suit needed to be easy to transport, easy to don & doff, reasonably comfortable without cooling...and most importantly, it needed to be easily recognizable by laypeople. That's been an ongoing issue with other suits; folks thinking Krampus is a goat or a werewolf or a wookiee...I'm sure anyone who's done outside-fandom events with outside-normal species knows what this is like. So...werewolf. Because peoples' minds are in a particular "slot" around Halloween, and because there's an almost canonical werewolf stereotype that one can aim for. Partial suit (head, hands, feet, tail and arm+leg cuffs) made by Takumori (Scaleworx Creations), using the Snarly K9 blank and accoutrements from DreamVision Creations and some long-pile fur from fabric.com (I'd brought some short-pile as well, but it wasn't a good match...anywhere you see short fur, he shaved that all down!). Taku added red LED eyes and a fan in the muzzle, both powered by a USB-rechargeable battery and with nifty invisible buttons. Standard-issue red flannel shirt from eBay and blue jeans from Goodwill were distressed with a 4" belt sander (fun! fast! messy!). Arm & leg cuffs were sewed to the garments so it'd be less time-consuming to put on, and anywhere there's a sizable gap I sewed a patch of fur so it'd show through, but not have to wear an entire hot fur suit underneath. To make him more imposing ('cuz I'm a beanpole) there's an upper-body muscle suit (also via eBay -- it's actually a wardrobe item from the Tim Burton Planet of the Apes, there were dozens if not hundreds of these made for extras so they're reasonably priced for the quality). Since the shirt would be open, I made and attached a fur front piece, laying the pile certain ways and stitching to create some contours without doing the whole perfect-shaved-six-pack thing. As a last-minute addition, I did some drybrushing (white acrylic paint) on most of the parts to add some variety and bring out certain contours. I'm not much of a werewolf person normally and wasn't "emotionally invested" in the character -- it was just to be a simple suit to fill a particular niche -- but it way exceeded my expectations (thanks mostly to Taku's work) and I'm super excited to start werewolfing! Raawr! 10th-Dec-2015 04:15 pm - FurCon: RARSUIT SHOW & YELL! Scheduled for Sunday, 1 to 2:30pm, in SJCC room 114 (downstairs, leftmost room in the glass "fishbowl" area). Doesn't conflict with masquerade, parade, etc. This was called the "Rarsuit Roundtable" last year. Different room now. No plans for a slideshow & talk this time around...I noticed that things really livened up toward the end as we went into show & tell mode, so let's just go straight for that. I call it SHOW & YELL! Bring your rarsuits! If you don't have one yet, bring your questions! Bring your work-in-progress, your rarsuit stories, share knowledge, hang out with like-minded monster people, groom ticks out of each others' fur, whatever. RAR! 1st-Aug-2015 10:30 am - Mephit Fur Meet registration open til Aug 7th! Hello! Joined the community not too long ago and was looking for some potential rarsuit help. I have a dragon I was looking to make with a very sloped, dinosaur like face. I have seen on really Dreamvisions Creations with dragon head blanks and wonder if anyone here could suggest/know of anyone else out there right now who makes dragon/dinosaur blanks. 15th-Mar-2015 12:28 am - Wow! Look at this hand made RAR suit! I found this on Twitter! This is killer!! I know that most people make tails without mechanisms inside and the way people walk and the lightness of the tail will make it move pretty realistically (hip-shaking FTW!). But if one wanted to do a snake character without legs (or like a naga), and have a long tail dragging behind in a sinuous fashion, would an internal mechanism be enough to make the tail wiggle? Or would rubber on the bottom help it catch and release the floor in a wiggly motion? Or would it require wheels and some other internal structure to get a snakey movement? Or, to cover another avenue, is it possible to extend a tail out from a person for a very long distance (let's say, 6 feet/2 meters or more) and have it supportable from the waist of the person without dragging the ground, along with the ability to sway back and forth?